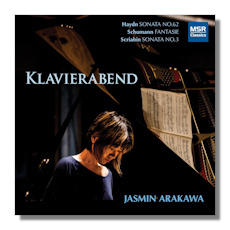 Japanese-born Jasmin Arakawa graduated from the Tokyo University of the Arts and earned a Doctorate Degree from Jacobs School of Music (Indiana University), where her teachers included Emile Naoumoff. She later had studies with Alicia de Larrocha, after which she developed an interest in Spanish music. Arakawa was a prizewinner at the Latin America Music Competition and has made several recordings, this being her third. Ms. Arakawa teaches at the University of South Alabama and also concertizes, including in the chamber realm. Leading off this disc is arguably Haydn's most popular piano sonata. Arakawa delivers a spirited and very sensitive account of the first movement, focusing more on the brightness and elegance of the music rather than on its elements of grandeur. She's right on target here and in the other two movements. Her dynamics, tempo selections, digital facility and phrasing in general are impressive throughout the work. The outer panels effervesce with color, energy, and subtlety, and the Adagio, which in the wrong hands can sound dour and even gloomy, takes on a more serious manner but also has an airy and sometimes playful quality. A strong performance! In the C major Fantasie Arakawa captures Schumann's expressive spirit with a deft sense for both the composer's quirky mood swings and his masterly sense to integrate every emotional and intellectual shift into an organized whole. In short, while Schumann can sound episodic and lacking structural design, Arakawa consistently phrases his music with a view toward conveying its unusual but imaginative form and expressive manner, in the end delivering a most effective account of the piece. She captures the wonderment and grandeur of the opening with moderate pacing and deft phrasing that point up both the lushness and anxiety of the music. The more intimate slower sections are lovely in her hands, the music gaining expression and nuance lesser pianists never dream is even in the score. Throughout the work it seems Arakawa misses no subtlety on the composer's emotional and intellectual canvas. This is fine – no, superb pianism that, if I can judge from this single performance, could place Ms. Arakawa among the finest interpreters of Schumann's solo piano works. Splendid as her Haydn and Schumann are here, what I think may be the most outstanding effort on the disc is that of the Scriabin Third Sonata. It's a brisk performance of highly charged character: the first movement main theme comes across with fire and thrust, much in the somewhat brusque manner of Sofronitsky rather than the more Romanticized approaches of Ashkenazy, Gilels, Lazar Berman, Gould and others. Some may find her first movement – and second, for that matter – a bit rushed and unsentimental. But her interpretation is full of emotion in that quirky Scriabinesque manner: at times the music doesn't seem to flow smoothly; rather, it moves along in spastic lurches and leaps with all kinds of nervous tics, and when it does flow, as in the third movement, its gait, though elegant, is filled with a tentative and almost tortured sense. In the finale Arakawa aptly returns to the fiery manner of the first and second movements. She imparts an almost palpable feeling of urgency and desperation, the music darkening as the movement proceeds, auguring an outburst of either catastrophe or triumph. She allows for the appearances of the alternate theme to provide brief oases from the general turmoil, but she then brings on the ending with drive and a curtness that effectively convey ambivalence in the supposed triumph of the closing moments. This is a thoroughly brilliant and imaginative performance that may induce many listeners to hear this piece in a different way. There has been a lot of bland Scriabin playing around for years, but this is anything but bland, serving as the perfect antidote to that still common malady. To some this will be a controversial reading, but it is bold, fresh, insightful and has a strong point of view. From the evidence here, I think I can conclude Ms. Arakawa is a talented artist of a rare order. I've heard a good many pianists who have regularly appeared at Carnegie Hall, Wigmore Hall, Berliner Philharmonie, Salle Pleyel and the like, who are less talented than Ms. Arakawa. True, she has appeared at Carnegie Hall and some other important concert venues, but she should be far better known and appreciated. Maybe this fine disc will aid her cause. By the way, MSR Classics offers excellent sound here and fine liner notes by Ms. Arakawa. A tremendously enjoyable recording! Highest recommendations!